Happy Monday! How was your weekend? Today I want to share another great workday breakfast with you. So, the story of this sandwich: When I was little, I used to eat nothing but jam or honey in the morning. I couldn’t even think about eating something like cheese before 12 am. Well, that has quite changed in the last year and now I love some fresh tomatoes or a toast with cream cheese just as much. That’s where this sandwich comes in. I came up with it when our fridge was practically empty and there was (almost) nothing left but pesto and a few tomatoes. 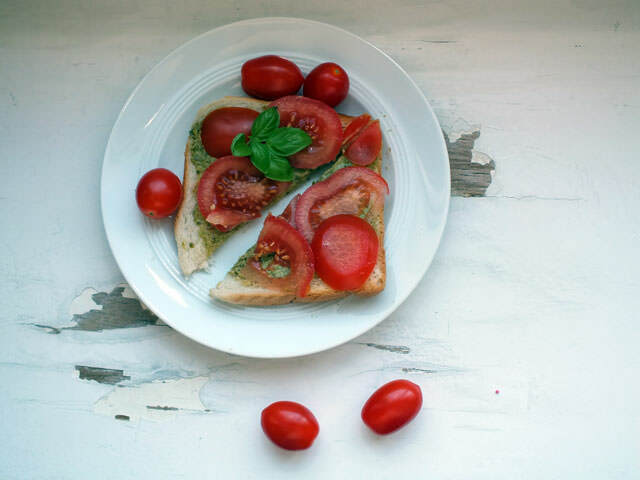 I really like eating paninis a la caprese (I think that’s the name) and these are also with pesto, so I thought I would just give this combination a try. What can I tell you: It’s soo good. And so easy. You have to give it a try. And when you can’t get past the need for something sweet in the morning, it this for dinner. It’s that good. Are you a sweet or savoury person in the morning?